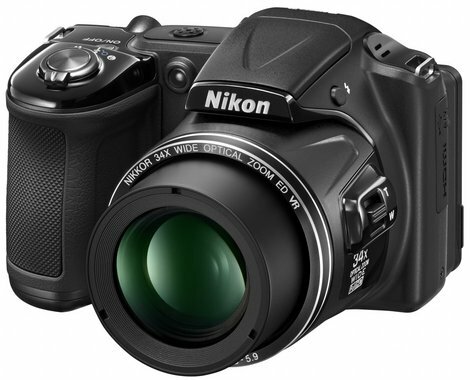 The Nikon CoolPix L830 is an affordable and compact mega-zoom camera. It features incredible versatility and good image quality, while remaining as easy to use as any camera you will find. Read more in our Full Conclusion. One of five new Coolpix cameras to debut at CES 2014, the Nikon L830 is a long zoom "bridge camera" (aka a point-and-shoot with the ergonomics of a DSLR) with a 16-megapixel backside illuminated CMOS image sensor (great for low light conditions) mated to a 34x optical zoom lens with a lens-shift VR (Vibration Reduction) system. The L830 can digitally zoom up to 68x, via Dynamic Fine Zoom, but typically digital zoom is best left turned off. Full 1080p HD Video Recording is another nice feature, especially since this one includes a Hybrid VR system to reduce hand-held camera shake. Beginners will love Easy Auto Mode, which automatically selects the best settings for current shooting conditions, as well as the Smart Portrait System, which helps users improve (yes, you guessed it) portrait style photos. Rounding out the feature list, the L830, which runs on AA-size batteries -- has 18 Scene Modes, a number of Filter Effects such as Skin Softening. Nikon's Coolpix L830 -- available in black, purple, or red -- has a MSRP of $299.95. Click our lowest price button at the top right to see the most current online pricing.